For visualizing the customer journey and their experience along the way. To understanding detailed user experience. To see gaps in the journey. To developing a sense of the flow of the experience. To consider the total context of the service that you are exploring. The service journey is a technique that maps the customer experience as a journey, much the way in which you might to plan a route and agendas for holidays. The map is divided into periods: pre- service, service and post-service: awareness, applying, proving, receiving, re-applying. The touch-points record the main user actions and intentions — and then they allow you to “connect the dots” and see where the experience gaps and connections are. Think about stages, touch-points, interactions and actors. 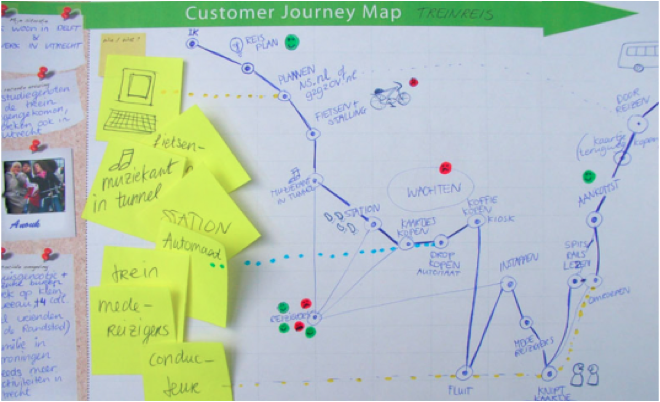 Use the tool to visualize the customer journey. Don’t forget to consider the entire environment and context for the journey. Don’t just map the journey once — go back and evaluate and refine.